Taste a piece of southern African culture at a traditional Boma dinner. 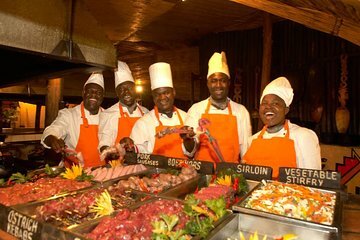 Guests enjoy a buffet supper of game meats and a la carte dishes. Take your taste buds on an adventure with servings of kudu, crocodile tail, impala, warthog, and ostrich, plus rice and vegetable dishes. The evening also includes traditional musical entertainment of dancing, drumming, and singing. Bottled water served on transfers to and from Dinner. Extra $25,00 pp return Transport fee for out of Victoria Falls town - We pickup and drop-off at Zimbabwe Border.